A feature-rich system in a compact, durable enclosure, the MC500 combines the popular Mini-ITX form factor with a carefully engineered, actively cooled chassis. With a range of Intel processor options, and long lifecycle components, the MC500 Series is both flexible and efficient. Small form factor doesn't have to mean limited capabilities. 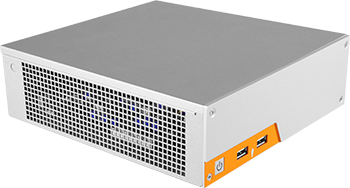 The MC500 combines the power of a traditional PC and the flexibility of a compact, all steel chassis. The MC500 Series was built with industrial applications in mind, offering a wide range of modern and legacy connectivity. The MC500 Series utilizes cross-case ventilation to keep fan noise to a minimum while providing the system with the ability to operate 24/7 without failure. The MC500 Series inhibits rust with its durable zinc coated steel construction. Double right angle folds at interfacing edges reduce EMI and improve EMC performance. The MC500 Series lends itself to limitless configurations with support for nearly every Mini-ITX motherboard. Eight mounting points support additional drives for storage intensive applications. From prototype to distribution, Logic Supply’s team of experienced professionals will ensure the successful implementation of your project, each step of the way.